It’s been a deadly week on Denver streets. Drivers have killed three people simply trying to cross the street. One victim, whom Denver PD has not named, was struck while crossing in a wheelchair at 29th and Colorado. Another, Karina Pulec, was trying to cross 13th at Broadway when Norlan Estrada-Reyes allegedly hit her with his truck and fled. Denver PD will provide police reports “as soon as they are ready,” a spokesperson told Streetsblog. The most recent victim was killed yesterday trying to cross Alameda near Clinton Street. All three fatalities occurred on wide streets designed to prioritize car traffic, with posted speed limits ranging from 30 to 40 mph. Mayor Hancock has said the city is committed to the goal of Vision Zero — eliminating traffic deaths. But in 2016, the trend is heading in the wrong direction. 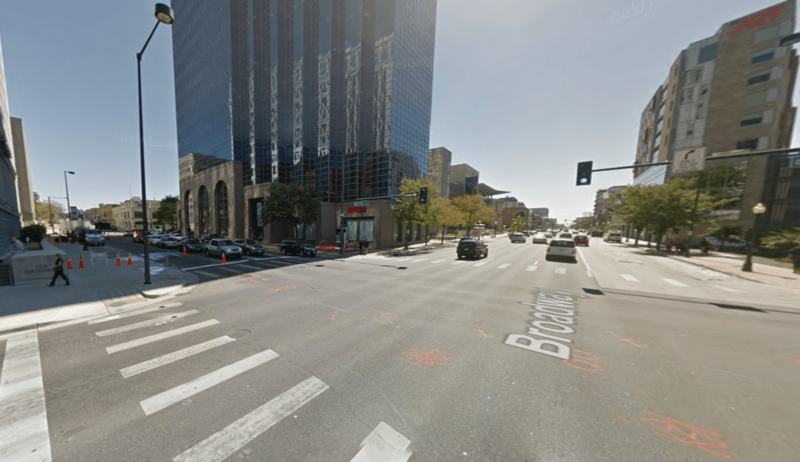 The toll this week brings the total number of people killed while walking or biking on Denver’s streets this year to 22, according to Denver PD. That’s two more than all of last year, in just a little more than 10 months. All told, 47 people have died in traffic crashes in 2016, five fewer than last year’s total, but on pace to exceed that number. Last year in Seattle, a city with a similar population to Denver, 20 people lost their lives in traffic collisions. That works out to about three deaths per 100,000 people. Meanwhile, the rate in Denver last year was 7.6 deaths per 100,000 people. While Seattle has committed to end traffic deaths by 2030, the Hancock administration has not set a timetable. Seattle also recently lowered its residential speed limits to 20 mph. Community and street design are the biggest determinants of people’s travel behaviors. To achieve the goal of zero fatalities and serious injuries, we must correct poorly designed areas that invite speeding and other unsafe behaviors, while providing complete multi-modal networks that enable people to get where they need to go. Hancock has budgeted some money for redesigning streets and intersections and plans to hire a full-time Vision Zero coordinator. Those steps can’t come soon enough. As the administration develops a plan, people are dying. Do you happen to have a list of names? A summary of crash location would also be helpful if you’ve already done the legwork, otherwise I’m able to sift through the stories. I’m writing a letter to my city councilmember and I’d like to make him acutely aware of the people who have died in his district this year while his staffer sends me e-mails saying they can’t design safer streets because it would increase congestion.